The UPS module is used for the uninterruptible power supply of CX CPUs and any connected CX components. In the event of a failure of the external supply, the module ensures that the application software can save important data, e.g. on a Compact Flash card, NOVRAM or in a database via the network. During the UPS retention time, the machine or process can be transferred into a defined state, and the operating system can be shut down. The retention time can be set via a rotary switch or via software. The use of state of the art capacitors makes this UPS module – unlike other battery-powered techniques – absolutely maintenance-free and offers rapid charging. The module can simply be added to a CX system. Only a 24 V DC supply cable is needed. The 24 V DC output voltage of the UPS is protected against short circuit and overload. The CX1100-09x0 may be retrofitted on site. A DPRAM user interface provides options for settings and UPS status messages. The functionality of the UPS is therefore independent of the operating system to be used. No driver software is required. The TwinCAT System Manager recognises the UPS module automatically. The UPS signals are available to the PLC programmer. When dimensioning the UPS, the power consumption of the CX device being powered must be considered. A controlled 24 V DC power supply unit with a minimum output current of 4 A is required. 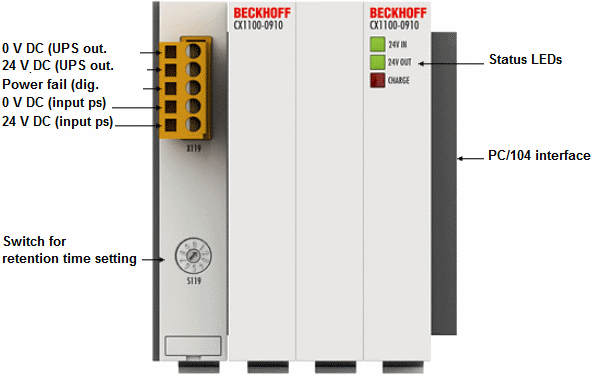 The CX1100-0920 UPS is recommended for UPS operation with a CX1020, the CX1100-0930 UPS is recommended for operation with a CX1030.